As I walk up the Alpine Trail in Denali National Park, I can see the vegetation changing before my eyes. Deciduous plants, like willows and smaller shrubs, start huge, as tall as my head and shoulders. But as the trail leads up, and as the altitude grows, the vegetation shrinks. 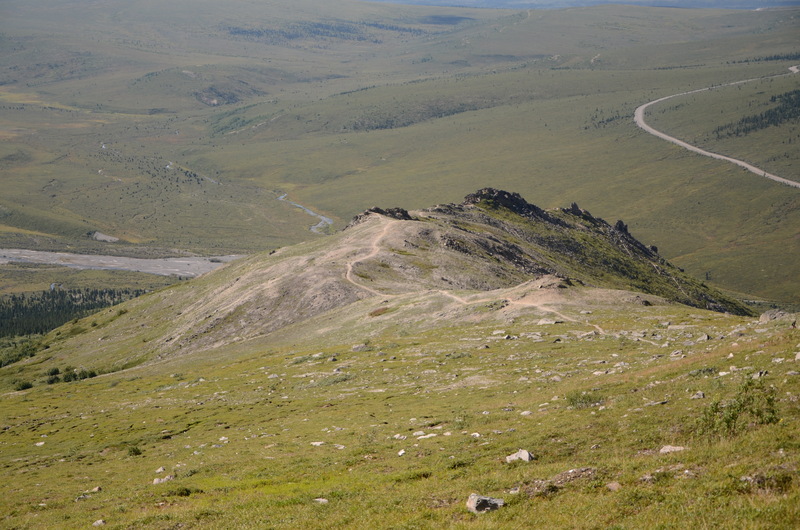 Over the course of the roughly 1,300-foot elevation gain, the plant life gets shorter and shorter until suddenly it’s almost gone—we’ve reached the tundra. By climbing up the side of this hill, we’ve mimicked traveling north into the colder parts of the Arctic, reaching the tundra much faster. Tundra is like the Arctic’s desert: an expanse of treeless land with little available water. Most water in the tundra is below the ground in a layer of continuously frozen soil known as permafrost. Between the tundra’s low temperatures and the permafrost, it’s not a hospitable location for much plant life. On the tundra, Peter Griffith, project manager for the Arctic Boreal Vulnerability Experiment (ABoVE), points out the same shrubs we encountered lower down, although here, instead of towering over our heads, they’re only a few inches above the ground. But that could be changing. It’s one element of the ABoVE team’s research: understanding how native Arctic vegetation responds to a warming climate. Griffith describes the shrubs as “ready and waiting to march up the mountain.” They’re opportunistic plants, and all it takes is a little warmth and thawed ground for them to dig in and start growing larger, a process known as “shrubification” and one of the causes of the greening trends seen from long-term satellite records. As greenhouse gases change Earth’s climate, the Arctic is warming much faster than the rest of the world. And the changes are staggering. Permafrost is thawing, and the shrubs aren’t the only ones taking advantage. Within the soil, bacteria are growing and beginning to metabolize organic matter that’s been frozen in permafrost for thousands of years. As they feast, bacteria release carbon dioxide and methane, which are released into the air. 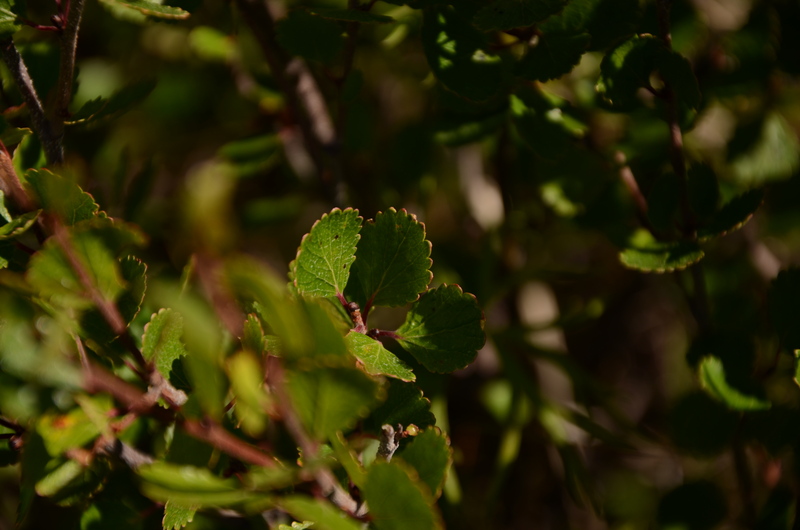 Plants like shrubs use carbon dioxide to grow even faster. In some ways, it seems like a race. Will the bacteria respire more carbon dioxide than the growing plants can absorb? At some sites, that already seems to be the case. How this race plays out across the Arctic is another question the ABoVE team is investigating. Using measurements of carbon dioxide and methane taken from flux towers sitting directly on the tundra, to instruments mounted on airplanes and satellites in low Earth orbit, NASA scientists are finding out how the land ecosystem influences the atmosphere in a greening Arctic, and what the consequences are for not only the Arctic but also the world. 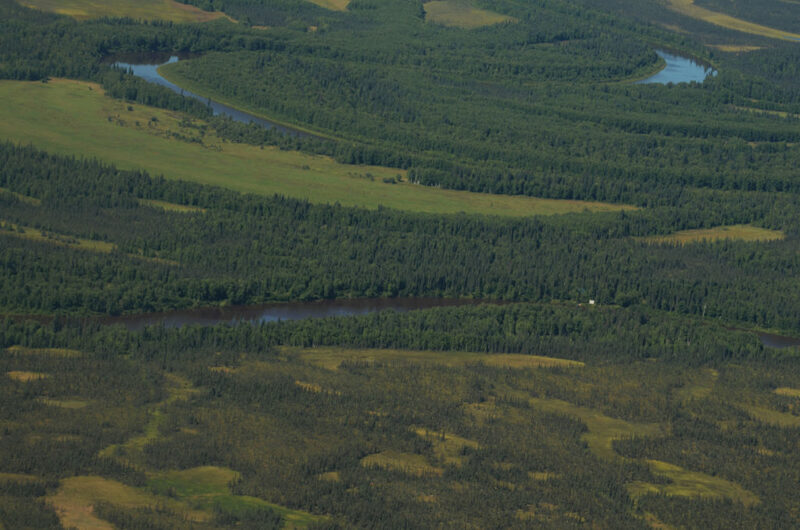 The Arctic Boreal and Vulnerability Experiment (ABoVE) covers 2.5 million square miles of tundra, forests, permafrost and lakes in Alaska and Northwestern Canada. ABoVE scientists are using satellites and aircraft to study this formidable terrain as it changes in a warming climate. In some ways, NASA’s DC-8 feels like a commercial airplane, with its blue leather seats and tiny bathrooms in the back. But once the plane starts to spiral down over Arctic towns, I remember I’m riding on a flying laboratory studying the amount and distribution of carbon dioxide and methane in the atmosphere. The whole process of spiraling down is a little scary the first few times we do it, but it’s necessary as an accuracy check for our science instruments, and by the third or fourth spiral down, it’s become a somewhat routine experience for me. 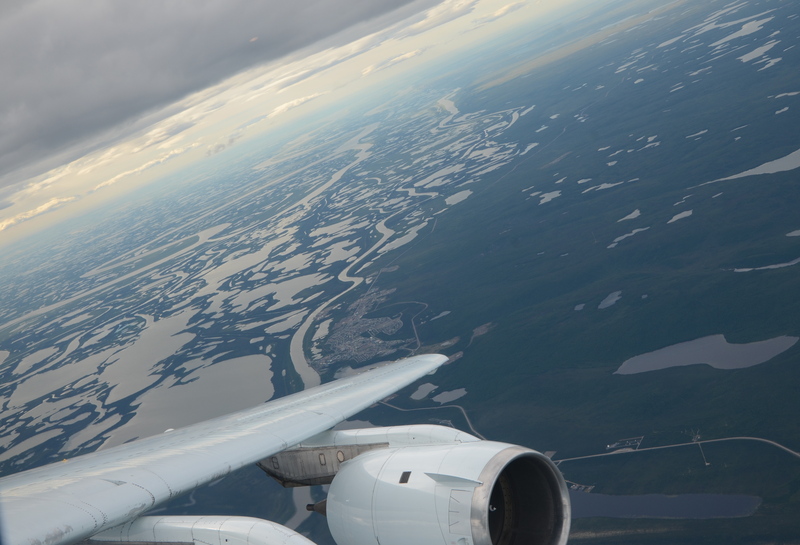 From the windows, I get a good look at the varied Arctic landscapes—twisting, braided rivers, carpets of spruce trees, and broad expanses of flat tundra all spread out underneath us. Each of those landscapes offers interesting scientific insights into how carbon emissions are changing as the climate warms. The plane is carrying five instruments designed to measure the spatial distribution of carbon dioxide from the air. They’re placed along the plane in place of some the seats and are operated by scientists monitoring screens mounted on their sides. Someday, a descendent of these instruments will fly on the Active Sensing of Carbon dioxide Emissions over Nights, Days and Seasons, or ASCENDS, satellite, and the spiraling helps the researchers verify their measurements by flying right through the columns of air they’re studying from far above. Jim Abshire is the project lead for the ASCENDS campaign. 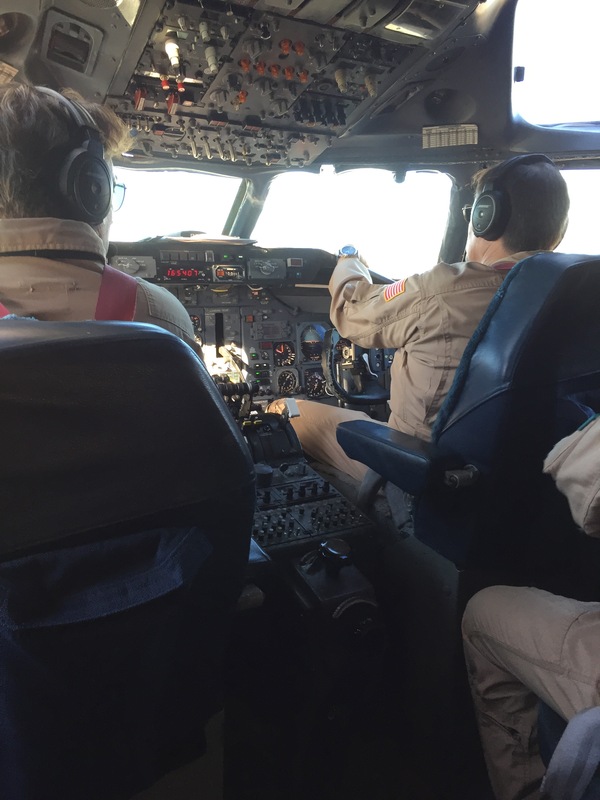 He sits near the front of the plane, plugged into the communications system and periodically checking with each instrument’s operators, making sure everything is running smoothly and requesting the occasional altitude change from the plane’s navigators. He describes the spiral down maneuvers as a check on the lidar measurement systems, specifically ensuring that the instruments are sensitive enough to make precise measurements from space. As Earth’s climate continues to warm, the Arctic warms much faster, and the subsequent changes in the Arctic regions are resulting in some soils releasing more carbon. More carbon in the atmosphere traps heat, causing more warming, which in turn causes the Arctic soils to release even more carbon, a process called the carbon-climate feedback. Understanding this vicious cycle is one of the primary goals of the Arctic Boreal Vulnerability Experiment (ABoVE), a NASA campaign that includes the ASCENDS flights, as well as many other experiments, all designed to better understand how the rapid environmental change in the Arctic regions of the world impact ecosystems and society.